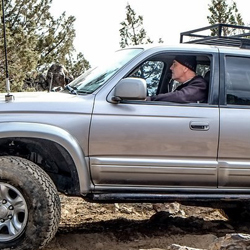 Trail leaders are skilled drivers with well-equipped trucks that have recovery and trail experience. They have distinguished themselves by promoting a culture of helpfulness and respect while supporting Tread Lightly objectives and Gitout Rules. In 2002 I purchased my first four wheel drive a 1992 Mitsubishi Montero. It took me on many off road adventures and began my love for off road driving. Over the years I've built a number of trucks including: 1983 Toyota Pickup, 1999 Toyota 4runner, 1986 Toyota 4runner, 2000 Mitsubishi Montero Sport, 1995 Mitsubishi Montero SR, 1992 Isuzu Pickup, 2013 Toyota Tacoma, 2003 Mitsubishi Montero and 2016 Toyota Tundra. My primary interest and passion is trail driving and expedition adventures. 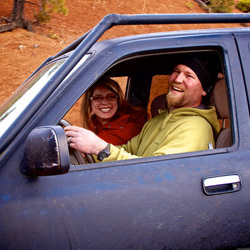 Gitout is all about helping people learn and experience off road adventures in a respectful, helpful environment. Hi! I'm Biff! I have been a member of the off road community since 1983 when I bought and built my 1946 Willys CJ2A. Since then I have had 4 Jeeps, and hit trails in Colorado, Wyoming, Utah, Idaho, Arizona, Wisconsin, Oregon. My current Jeep is a 2012 JK Unlimited Rubicon that has been slightly modified . 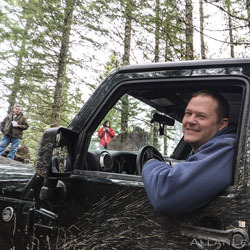 As a trail leader I hope to bring safe and fun adventures to the group, and to pass the tradition of Off Road Enthusiasm down to the up and coming drivers of our group and the community. I joined Gitout in September of 2012; what a great group to belong to, each and every run has been fun and respectful of the world we travel in. I enjoy pretty much any activity that gets me outdoors, but my favorites are four-wheeling and mountain biking. I would like to organize a trip or two that offers some great four-wheeling and some first class mountain biking. 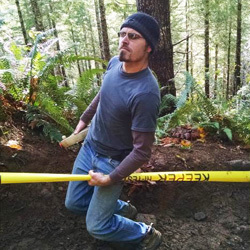 I think shuttling some Oregon downhill single-track and then heading back to remote camp to enjoy a cold beer and warm dinner cooked over the fire sounds like the perfect weekend activity. Actually, it sounds like the perfect weekday activity too. You can find Kai & Fran (the dogs) and me out on the trail in our 1988 Isuzu Trooper. I've been an outdoor enthusiast my entire life; from hunting, fishing, white water rafting, hiking, mountain biking, camping and spelunking. The most important things to me is making sure everyone is safe, nobody is left behind and always leaving the surroundings cleaner than when you arrived. You'll usually find my wife (Traci) and I bringing up the rear on the Gitout runs. Hope to meet all of you soon!!! Hi I'm Andy. I grew up in the Pacific Northwest and I couldn't imagine living anywhere else. I bought my first 4 x 4 over 25 years ago. I've been exploring the forests and back country routes ever since. I am a strong believer in the tread lightly ethos. Taking out more than you bring in. It's my job to make sure that you have a great time with us, safely and responsibly. I hope to see you out on the trail! My name is Rodney. 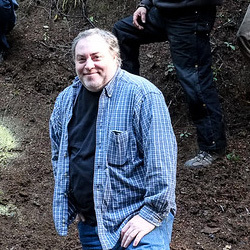 I've been involved in outdoor activities my whole life, including hiking, snowboarding, camping and adventure seeking. I started four wheeling with my uncle at about 8 years old and got my first ATV at age 9. Back then, I could ride straight from my home onto dirt roads that provided endless adventures! Over the years, I eventually got into four wheeling more and riding ATVs less. Over the last 19 years, my four wheeling vehicles have consisted of a ’94 Ranger, an ’86 Samurai and now an ’05 Wrangler Unlimited Rubicon. You will typically see me four wheeling with my two young daughters, which both started four wheeling before they turned 3. 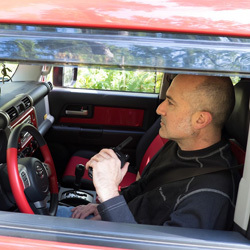 I look forward to experiencing new adventures together and helping others learn what their vehicles are capable of. I also hope to pass on the love of the sport and a respect for the responsibility we have to preserve access for future generations. I'm Allan Leahy I've been an outdoors man since I was a boy scout. I grew up on the east coast camping, hiking, and biking. I moved to Oregon in 2003 and started adventure motorcycling. I was hooked by the enormous open spaces here in the PNW. I started serious 4 wheeling in 2012 when I bought my 4Runner, since then I have sold most of my motorcycles and commited more and more of my time 4 wheeling and overlanding. I'm commited to safe and sustainable 4 wheeling. I'm also an avid photographer. I started reading 4x4 magazines when I was 13, so I have been interested in off-roading for as long as I can remember. My first 4x4 was a 1977 Chevy short bed bought in 1979, I Truck Pulled for 3 years with a 1969 Chevy, but when they got too big for the Trails “Naches”, I went with a CJ-5, and now have had the D-90 for the last 9 year. I work for Warn Industries, and had worked for a couple local 4x4 stores in the area, so I have been in the off road industry for about 28 years. During this time I have put on safe winching demonstrations, including a couple for GITOUT, lead trail rides, competed in off road events and organized off road events. 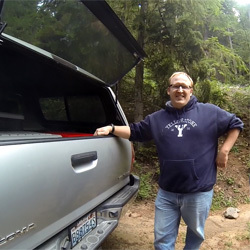 After tagging along on a few GITOUT runs, and realizing the GITOUT people have the same passions as I do, it came time to give back and help a great group of off-roaders and be a trail leader too. 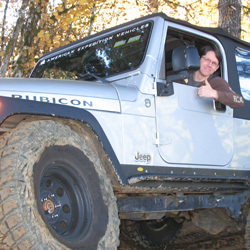 I’m looking forward to leading some fun trail rides so I can share my 4x4 experience with others. I’m Michael Hollinger. I guess you could say I began my off-road experience during my college years in the early 2000’s, driving my ’86 Honda Accord wherever it wasn’t meant to go... a LOT of places it wasn't meant to go. In 2008, I had enough money to buy my first truck, a 2008 Toyota Tacoma. I vowed to never be stuck again, and explore everywhere I could go. I never guessed where that would take me! I’ve crawled boulders, managed my way through mud and waded through rivers. I’ve cut metal, removed parts and add more parts. I’ve had the opportunity to study under great trainers, help save lives and teach others. 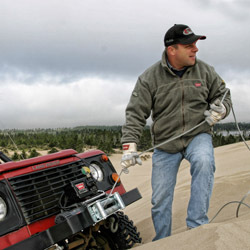 As a trail leader, my goal is to share my knowledge of safety, recovery and vehicle operation so that you can wheel with confidence, respect – and achieve things you never thought were possible! their routine. I'm looking forward to meeting new people and swappin' stories! I’m Lance Noell and I’m a Gitoutaholic. I grew up in South Georgia and moved to the NW in 1996. Growing up on a large farm, I learned to drive 4x4’s, tractors, 4wd tractors (Steiger) and even a CatD9 before I had a learners permit. My first truck was an 89 S10 4x4 that took me across the US roughly three times and many forest roads in Ga/NC/Co/Wy/Mt. I worked in Yellowstone for two summers (during the great fires of 88 and back in 89), with Colorado in the winter, and did well over 200 miles of backpacking in the park. I love the Rockies, but there’s no good seafood, so I kept looking until I found the PNW. Now that I’ve found the friends and comrades of Gitout I can’t think of a single place I’d rather live in order to explore, learn and practice the ethics of “Tread Lightly”. My FJ is being built with a major in expedition and a minor in trail runs/crawling. Peace! and see you on the trails!